Technology Week - Day 3 - The Drones have landed! Another fun day at Weddington Primary, shaping our computer geniuses of the future. 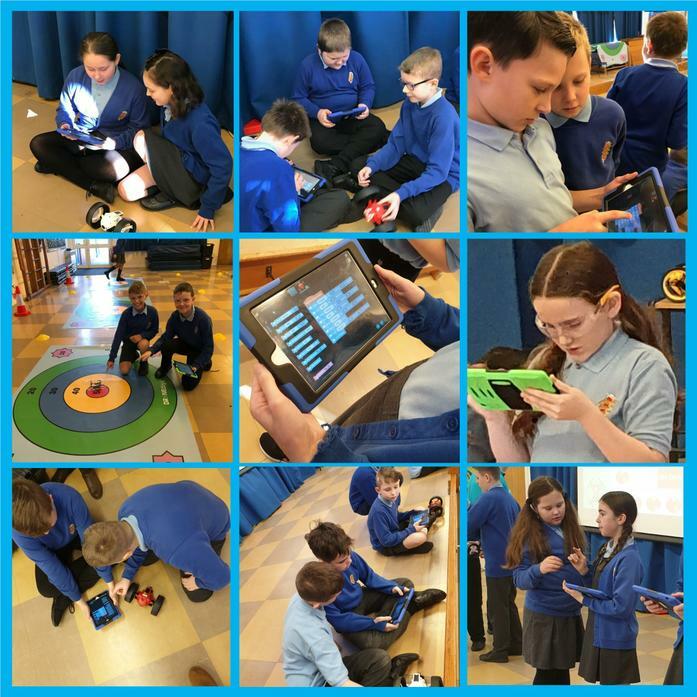 Year 6 had to combine a variety of maths and programming skills and add a great deal of trial and error with a good serving of perseverance to solve two separate drone challenges. First of all, the children worked in pairs to figure out the code which would successfully navigate their ground drone around the assault course. After that, they took to the air! This time the challenge was to fathom the code which would successfully fly their air drone from the launch pad to the target - ask them, what did they score? The session ended with the children discovering the variety of ways which drones are used in everyday life ... and the concepts for how they could be used to help us in the future. Foundation Stage have begun to think about the biscuit they would like to create and how they will be able to use code blocks to instruct a friend to make their concept. Year 1 have been solving some navigational challenges using 2go on Purple Mash, how many challenges did they manage to solve? What did they find difficult and what was easy? Year 2 found out that digital images are made up of thousands of pixels, which when viewed together, create the image they see on the screen. In order for them to see this in action, they have coloured their own pixel colouring sheets. They had to think about the best way to approach the colouring, would they do all the same numbers at once or perhaps attack it a row at a time? Was there maybe another way they decided to complete their sheets? Year 3 were only able to communicate by indicating a symbol to their partner, each symbol representing a different instruction. Could they get their partner to recreate the secret image they were looking at without using words? This involved a few levels of coding - demonstrating to the children the need for the precise algorithms that computers follow and that they don't speak our languages. Year 4 have been hard at work attempting to create their Viking Ships, their challenge was to create a 'boat' which could travel across the hard floor without it being pushed along - a problem solving exercise giving the children the chance to work as a team and overcome problems. Their boats are all ready to be used in their Green Screen Animation sequences tomorrow. Year 5 have delved in to the world of AI, developing a tourist information app which could be used to suggest North American tourist spots to potential visitors. This has required a mix of research, data input and complex coding.